Public Transit by Fraunhofer FOKUS provides passengers with real-time data about schedules, delays, interruptions and alternative travel options. Public Transit is a Web-based multiscreen application for touch screen displays and smartphones which acts as personalized travel assistant informing you of the public transport options at your disposal. Public Transit uses the General Transit Feed Specification (GTFS) of VBB Verkehrsverbund Berlin-Brandenburg. 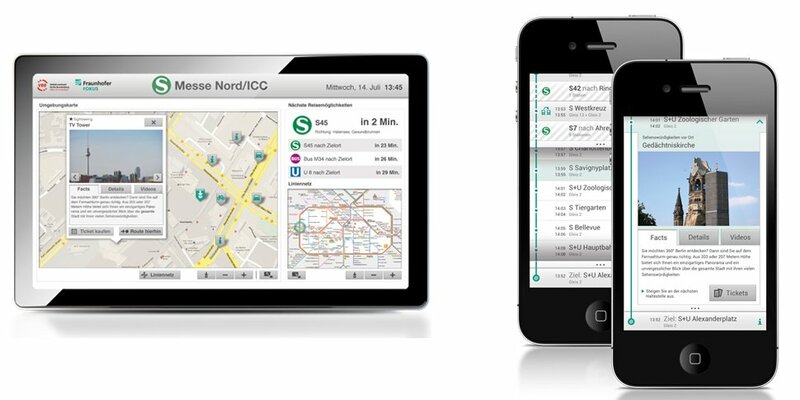 The primary purpose of implementing Public Transit is to improve access to public transport through multiscreen applications in Berlin and the surrounding area. Static network maps and traffic information are things of the past. Imagine the bus you are waiting for is delayed. The schedule tells you the next public transportation vehicle will arrive in just a few minutes – as they are supposed to arrive every 5 minutes at this particular station. But there hasn’t been a bus for half an hour. This project is in cooperation with the VBB Verkehrsverbund Berlin-Brandenburg GmbH and visualizes the potential of real-time traffic data of trains, trams and busses with the help of the General Transit Feed Specification (GTFS). Today’s passenger could find out the current position of their particular bus, its delay and alternative routes, when real-time information would be available or integrated. Public Transit is a multiscreen application for touch screen displays and smartphones. Real-time data of the current traffic flow is processed and visualized on the screen. Based on this data Public Transit provides services such as traffic information, route planning, tourist guide, car and bike sharing. Therefore each station is equipped with public Wi-Fi, touch screen display and Public Transit as a software solution. Passengers operate the application via touch screen display to obtain information concerning the current traffic situation; how much traffic is to expect before passengers leave for work? When the next train will arrive as the passenger is standing on the platform? How are traffic conditions and which are the alternate routes, before passengers leave for work or a sightseeing tour? Berlin also offers various additional transport services. In the case of interruptions or delays, residents receiverecommendations for alternative travel options such as car or bike sharing. From the tourist perspective, Public Transit offers information concerning points of interest such as tourist attractions, restaurants, museums and events. Tourists have the ability to plan routes via public transport to the selected point of interest. Finally, planned routes will be seamlessly transferred to the smartphone of the passenger. Travel information on the smartphone is complemented with real-time traffic data, alternative connections in the event of interruptions and sightseeing recommendations for tourists. Public traffic data is provided as a General Transit Feed Specification (GTFS) feed as an open data format for public transportation schedules and associated geographic information by VBB Verkehrsverbund Berlin-Brandenburg GmbH. Public Transit provides a GTFS component for processing traffic data from public transport companies. Passengers view station information and schedules, get step-by-step transport directions, plan trips on touch screen display and synchronize these with their smartphone. A real-time notification component provides passengers with a constant stream of up-to-date real-time traffic data. This data can be viewed on touch screen display and smartphone. In order to allow as many passengers as possible to use the features of Public Transit, Fraunhofer FOKUS provides a multiscreen application based on newest Web technologies. Public Transit provides multiple synchronization mechanisms to keep applications synchronized. This includes application data synchronization, application state store and restore, preferences exchange and merging. The primary purpose of implementing Public Transit is to improve the attractiveness of public transport, to increase public transport utilization, and to demonstrate the urban potential of open data for passengers, municipal companies and local authorities. In particular, the open access to traffic data offers opportunities for the promotion of innovation, transparency and participation in Berlin. Fraunhofer FOKUS is the leader of the Berlin Open Data Strategy (BODS) by designing, implementing and operating the Berlin Open Data Portal. In cooperation with the partners of the Berlin Open Data Portal and VBB Verkehrsverbund Berlin-Brandenburg GmbH, Fraunhofer FOKUS is currently working on the development of additional selected transport applications and the provisioning on the necessary tools for their implementation and deployment.